It is hard to believe that the California Native Sage Festival took place nearly a month ago. How time flies by! This was our second year celebrating the greatness of sage including having booths that featured sage related products, native food tastings and demonstrations, and sage advice for your garden. This year (same as last) I was helping to hand out samples of food that incorporates our native sages (Salvia). I always enjoy sharing information about the wonderful native plants of California but when I can share information about food made with native plants, I am doubly happy. Today I would like to share with you a recipe for the Lemon Sage Shortbread that I prepared for the California Native Sage Festival March 28, 2015. If you enjoy this recipes and want to learn more about preparing food with California Native Plants please register for the upcoming California Native Food Symposium (November 14 and 15, 2015). I am very excited to be a part of this event. Antonio Sanchez (Nursery Production Manager) my collaborator and fellow enthusiast in native food is playing a key role in the symposium and will be giving a presentation on California Chia, Beans and Berries: How Rancho Santa Ana Botanic Garden and friends can help develop low-water foods for the future. Antonio frequently teaches a native food workshop at the RSABG and some of his recipes have been posted here. In a medium-sized bowl, whisk together the flour, powdered sugar, salt, sage and lemon zest. Pour in the olive oil and stir until it is incorporated. Transfer the dough to a 9 X 9 inch baking dish (I sprayed mine with vegetable oil). Use your fingers to squish the dough into an even layer. Prick the surface of the dough all over with a fork. Bake for about 45 min until the surface feels firm to the touch and is lightly golden around the edges. Remove from the oven and let the pan cool for 20 minutes (no sooner and no later, 20 min is the right stage, or else it will be too soft or too hard). Then, using a very sharp knife, slice the shortbread into 8 even columns and 4 even rows. Let the cookies cool before removing them from the pan using a small spatula. Botanists should really love all groups of plants, but sometimes, like many things in life, you cant help but love certain groups more than others. For me, Linanthus has always been a plant group that I have loved. 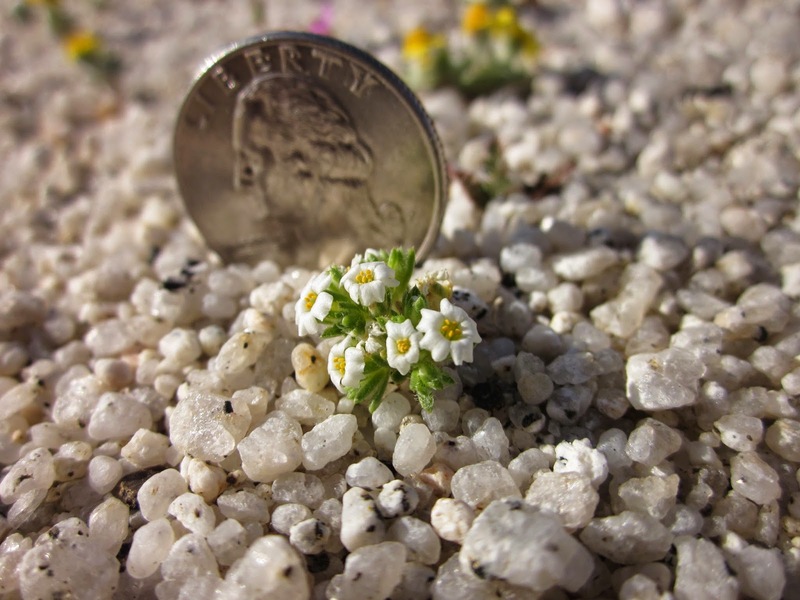 The majority of Linanthus species are small annuals, sometimes referred to as “belly plants” because you have to lay down flat on your belly to observe them as they are so small. I’ve also always loved the genus Linanthus because many of them are very ephemeral, meaning they are only around and in flower for a very short time per year, sometime just a few weeks, and the conditions have to be just right or they may not appear at all, so when you do come across them in the wild the experience can be very special. Linanthus killipii, the magenta colored variety. The first Linanthus species I was introduced to was Linanthus killipii. I was a Rancho Santa Ana Botanic Garden intern at the time and I was out with Naomi Fraga doing plant surveys along the Pacific Crest Trail in the San Bernardino Mountains when we came across this species. It was so small that it took me a few moments to see what Naomi had found. Standing at only a few centimeters tall they can be quite easy to miss! Linanthus killipii is commonly known as the “Baldwin Lake linanthus” as the majority of populations are found around Baldwin Lake in the San Bernardino Mountains. While the flowers are almost always white, there have been a few populations found that are rose/magenta color, which we are still unsure of what is happening there. A common garden study will hopefully be done here at RSABG in the future to try and determine why they sometimes appear as a different color. This was the first Linanthus species I saw in the field and to date is still one of my favorites. In fact if I had to give a top five favorites list of all plant species Linanthus killipii would be on the list. It still brings a large smile to my face everytime I come across this species in the field. In the Spring of 2010 I was given permission by the Wildlands Conservancy to enter and document plants in the Sawtooth Mountains just outside of Pioneertown, a mountain range I had wanted to explore for some time because it looked so rugged and unique, but had been closed to the public for many years for restoration purposes due to a large fire that had occurred across the area. On my first trip into the Sawtooth Mountains I came across a curious little Linanthus species that I did not recognize. Later that day while wraching my brain on which one it could be I would remember that Naomi Fraga had mentioned that there was a potentially undescribed Linanthus species on the east side of the San Bernardino Mountains, but I had assumed she had meant somewhere higher up in elevation, but sure enough, after I sent Naomi a few photos, she confirmed that I had found the undescribed Linanthus that she had found in the herbarium under an incorrect identification. 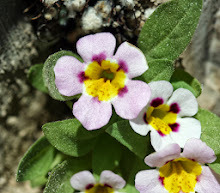 Over the next few years I explored the entire area and assisted in the description of this Linanthus species which we named Linanthus bernardinus, common name Pioneertown linanthus as it is only found around Pioneertown. Linanthus bernardinus is actually a very narrow endemic, meaning that it is only found geographically over a very small area, in this case only in the Sawtooth Mountains which are only around 10 square miles in area. I always make sure to do at least one hike in the Sawtooth Mountains every spring just to visit this little guy. 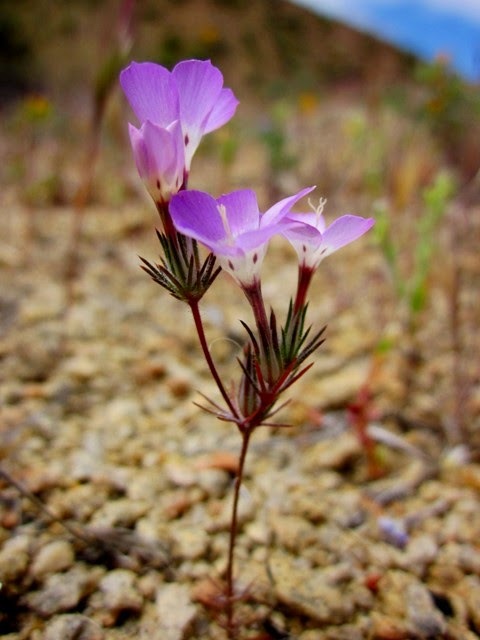 In southeastern San Diego county there is a cute little Linanthus species appropriately named “desert beauty”, or Linanthus bellus that I got to work with one season while doing a CNPS project. Its stems are narrow and wiry so the flowers often look like brightly colored little floating cups. When found, it usually grows in small localized population in open flat areas among the desert chaparral in the greater McCain Valley area. Unfortunately the majority of habitat where it occurs in McCain Valley is being developed into a large scale wind farm so if you would like to see this showy little belly plant you should do so soon. One of the most recent Linanthus species I’ve had a chance to make an acquaintance with is an undescibed, or soon to be described, Linanthus that will be called Linanthus maculatus subsp. “emaculatus”, its common name will be the "immaculate linanthus" as it is spotless, and also may possibly be known as the Dos Cabezas linanthus as it is only found in a single wash beside a geographic location called Dos Cabezas. Doing field work on this plant was rather hard as it is so small and difficult to find. During most field surveys one can look around and take in the scenery, but this plant is very tiny and blends in with its environment so when I did field work on this one I had to walk around for days staring straight at the ground in front of me so I would not walk past them. Literally a pain in the neck, but well worth it to find such an amazing little plant. This is another narrow endemic, only found in a single wash on the east side of the Jacumba Mountains, its entire habitat occurrence area is just 1 or 2 square miles. That’s a narrow endemic! At first we were worried as the only known occurrence was from a section of this wash that was being developed into a large scale wind farm, but after I conducted field surveys I found that they occurred across the county line as well in the Anza-Borrego Desert State Park, which conservation wise is a relief, as they will have at least some form of protection within the State Park. Being such a narrow endemic we will have to keep our eyes on this one in the coming years to make sure that its habitat is not heavily altered, because it would be sad to see such a tiny unique plant erased from the world. At the beginning of every field season I look forward to my first encounters with species in the Genus Linanthus in the wild as I never know if it will be a species I have not seen before, an old friend, or potentially one that could be new to science. They are a unique and special group, and one most enjoyed by laying out flat on your belly while exploring their tiny little world.